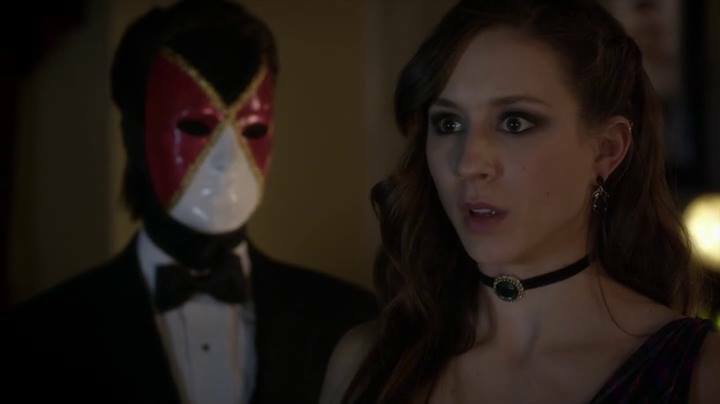 Spencer (Troian Bellisario) came face-to-face with "Big A" aka Charles DiLaurentis. HOLLYWOOD—The one thing about “Pretty Little Liars” is that the series sure knows how to leave the audience grasping for more and pondering a multitude of theories. The season five finale “Welcome to the Dollhouse” gave viewers a big reveal, but not what we had been expecting. So we know Charles DiLaurentis is “Big A,” but we didn’t actually see Charles’ face. So what gives? The actual identity of the villain or villainess (yes, I’m making that assumption, cause you never know with this show). The writers and executive producer I. Marlene King have teased some very inquisitive tidbits about the elusive party. The viewers have been informed ‘Charles,’ that name is not a total given, is someone who is “fiercely intelligent,” “devious” and “wrathful,” and we’ve seen them before. Those are some important words to consider as it allows a bevy of potential suspects to be knocked off the list. This is someone who is super great with computers, which leaves only two possible individuals that we have seen on the screen, Caleb and Lucas. Caleb automatically falls off the list in my opinion, but Lucas is one suspect that has been high on my radar for a ton of reasons. More on that later. I know what many are thinking that Jason has a twin, but that photo of the two boys plastered in “A’s” vault and on the home movie looks nothing like, so let’s eliminate the identical twin theory. Now that doesn’t mean that Jason and Charles aren’t fraternal twins, which I highly suspect. The biggest clue the audience received was that “A” was recreating a prom from seven years ago, one that Melissa and Ian both attended. So what does that mean? “A” would likely be around the age of Melissa and Jason. So what residents in the town of Rosewood fall into that category? Well you have Ezra, possibly Detective Darren Wilden and Wren. I don’t see any of them as possible contenders. Why? Well Ezra was too busy helping search for the liars, and he can’t be in two places at once; Wilden is dead and when it comes to Wren, if he was “A” that means he had a fling with his half-sister Spencer. Yeah, that’s a bit creepy to say the least. So I’m not so sure the show would head in that direction out of fear of causing viewers to tune out. So what contenders do we have left, Jason DiLaurentis, Noel Kahn and Lucas Gottesman. Many fans are already speculating that “A” has to be a bit older than the liars, and I thought the same thing, but what if we’re wrong about that notion. Could it be possible that “A” is actually around the age of the liars themselves? That is what I’m theorizing. Noel has always been a creeper, but the audience has no reason to speculate as to why he would want to torture the liars, besides he was the one helping Ali to stay hidden so to see him to a complete 360 wouldn’t make sense. That leaves only two potential suspects: Jason and Lucas. Jason is connected to Spencer and Alison by blood, and it’s apparent he and Charles were as thick as thieves, but wouldn’t he remember having a brother or perhaps it was a memory erased. The big problem would be figuring out his motive to want to take down these girls, as the connection between Aria, Hanna, Emily and Mona fails to connect in my opinion. So I’m placing my money on Lucas for a bevy of reasons. He’s a mastermind in the intelligence department and has already proven to be a member of the “A” team while working with Mona. Who better to steal the game from Mona than the person she mentored. I know many are asking to connect all the dots. That’s the problem; there are so many things you can theorize your brain might explode. The one thing that is certain is that Charles has a connection to Mrs. DiLaurentis, to Radley, to Bethany and to Alison. If you can piece the ‘why’ of those four things it will all make sense. I have indeed established the connection to the liars. Ali tortured Lucas beyond belief making him an outcast similar to Mona. He had befriended Hanna, who only saw him as a friend, hence the betrayal element. Both Aria and Emily are guilty by association. The one clue that nailed things for me is that episode that saw “A” playing with that toy car with the liars as his prisoners. That made me think who else would play with toy cars besides Lucas! I suspect Lucas is Alison’s brother and he has an intense love/hate relationship with her. The second dress Mrs. D had hidden in the piano is critical, as it would connect all the dots in my opinion. Was it for Lucas, was it for Bethany, was it for Spencer, just who was that second dress for would explain a lot and create more cohesion in this mystery. The thing we have to remember is that we’ve been alerted that ‘The Black Widow’ or ‘Lady in Black’ is endgame. That person I have no doubt in my mind is either Melissa Hastings or Ashley Marin. They have a connection with “Big A” that has yet to be revealed, but its one so big it makes sense for the entire “A” game if you ask me. My biggest concern is that the writers keep the motive or the ‘why’ as simple as possible. If it becomes too entangled or too complicated it won’t make any sense for the audience to connect all the pieces in a reasonable manner. I want to hear your theories on who you think CHARLES is on “Pretty Little Liars” email me at ladale@canyon-news.com.